When you subscribe to our Netvibes Premium offer, you gain access to all VIP features and other features such as Tagging, Analytics Apps and MisoData App, which add powerful “adaptive social analytics” to our award-winning monitoring solution and offers the first complete platform for both monitoring and analytics. All of these features are described in the section below. Until now brand managers and social media professionals had to choose between monitoring OR analyzing. With standard monitoring tools, users could gather and read content, but couldn’t automatically analyze them in aggregate. With standard social analytics tools, users could generate high-level reports, but couldn’t directly explore the original content or discover new trends as they emerge. Netvibes is the first complete platform that enables users to accomplish monitoring AND analysis side-by-side. Click on the Add button (1) and select the Analytics App (2). From there, you can see articles from all your dashboard during your retention period. You can change those parameters on the left panel (3). Within: you can search on your entire dashboard, or a specific tab or feed. Topic: here you can enter a specific query based on the query syntax. Period: you can define a specific period to search on. On the right panel (4), you can filter these current results with 10 facets: location, date, tag, people, emotion, sentiment, author, organisation, event and domain. Click on any facet, then select a value. Results in the middle of the page will automatically update with the new filter. If you are happy with this search, you can save it by clicking on the “Save changes” button. The topic field will be updated with this new filter and you will be able to generate all Analytics Apps (5) based on this search. A Tracked Topic App is the result App of a Universal search (once you have saved your research). From this Tracked Topic App, you will be able to analyze articles found. Select which Analytics Apps you want to create (What, Where, How, Who) or click on “Overall analysis” to add the 4 of them at once. The Analytic App based on the Filter App will be added above. These 4 live Apps each answer a different question with dynamic visualizations and interactive viewpoints covering: Who, What, Where, When and How. Each dynamic App lets you quickly drill down to explore and analyze interconnected trends, influencers and ideas. For example, your influencer app may tell you who your top influencers are. You want to learn more about what blog your #1 influencer writes for and exactly what is being said about your product. Netvibes will instantly create a new app just to analyze those specific keywords revealed by that one influencer and track them over time. This What App allows you to analyze the evolution of articles talking about your query. Articles: displays a graph showing the number articles for the selected period (with different graphic views). Keywords:: displays a cloud of tags for the selected period. This How App allows you to analyze the articles tone (positive, negative or neutral). Tones are calculated via an intern algorithm. You can choose to display results either as Horizontal bars or as a Pie chart. This Who App allows you to analyze Influencers. You can choose to display results as Horizontal bars, Pie chart and lots more graphic views. This app allows you to analyze what domain or type of websites mention the query (press and media, blogs, forum, social network, video). Hovering on some elements of those apps will give you a bit more information about it. For instance, if you put your mouse over a media in the Where App (media), it'll give you the pourcentage of articles of this media. Also, if you click on it, you will be given the choice to “pivot”, which means you can then dig deeper into the analytics by creating a new Analytics App related to this element. At this point, you can also decide to “Read recent articles” or “Add a note” corresponding to the selected element. You can drag any Analytics App in Netvibes Premium onto another to create new comparisons in real-time–instantly, on the fly. To do a compare, simply hold the click on the drag and compare icon (top right of the app) and drag & drop the app onto another to generate a new app comparing the two (eg. “What is said about ‘X’” to “What is said about ‘Y’”). After the drag & drop process, the dashboard will present you with a preview of the new Compare App. There you can choose the tab you want to add this app. Click on the green button to validate or cancel the comparison by clicking on the cross in the top right corner. You can also ask for the original apps to be removed, by ticking the “Remove original apps” box. MisoData allows you to import your custom spreadsheets into your dashboards and compare them with other reports easily. 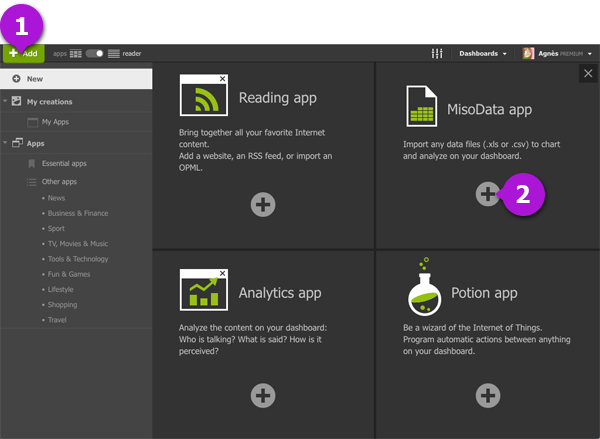 Click on the green Add button (1) and then select “MisoData App” menu (2) to display the MisoData wizard. There are 5 steps to create a MisoData App. Select the type of data you own. Click on the “Next” button corresponding to your kind of data to go to the next step. Upload your data: from a local file, from the cloud, or by pasting it directly. Once done, you will see the preview of your data on the right panel. Click on the “Next” button (6) to go to the next step. This is where you get the chance to mark columns you want to chart: simply enter the IDs of columns (7). You can use “*” to keep them all. Then select the output type (8) (i.e. how you want your results to be shown). Depending on your dataset, results will be aggregated over a time period (hourly, daily, weekly, monthly, quarterly or even yearly). You then need to decide how they will be aggregated over that period. sum: displays the sum of all data in each period. average: displays the average value of all data in each period. max/min: displays the minimum or maximum value for all data in each period. Click on the “Next” button (9) to go to the next step. Customize the final app on this step.